Every year, American veterans return home from around the globe to re-assimilate into society. This transition is usually a difficult one, often made even more challenging by debilitating injuries suffered while serving. The World’s Largest Golf Outing has made it their mission to help ease this transition, by providing an unlikely source of rehabilitation: Golf! For wounded veterans, the challenges are both physical and psychological. 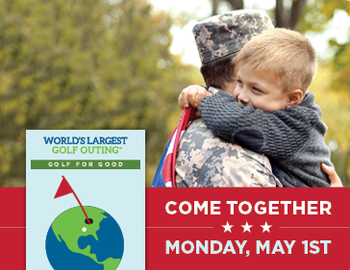 The World’s Largest Golf Outing has partnered with military charities over the past seven years to provide an outlet for these brave men and women, among many others. The event allows them to see how much they are appreciated and helps clear their minds with a round of golf among friends, family, and fellow servicemen and women. The response has been remarkable. Since 2011, The World’s Largest Golf Outing has raised over $3.5 million for various charities, and this year’s event right now has 26 States and Ontario on board with upwards of 3,000 pre-signed golfers, and is shaping up to be one of the largest in history. Supporting Fisher House Foundation and Arnie’s Army Charitable Foundation, WLGO 2017 will take place on Monday, May 1st at over 125 golf courses in the United States and Canada. All players are welcome, regardless of skill level, age, or gender! Sponsorship opportunities are available, and donations are highly encouraged. Golf’s true philanthropic potential is uncovered at outings and events every day, and will be on display in full force at The World’s Largest Golf Outing! Those interested can consider registering for or donating to the World’s Largest Golf Outing this year. A cause and a record certainly worthy of the effort.